Submitted by Raven on Wed, 10/24/2007 - 19:37. There are many reasons to buy local food, including reducing energy use, reducing sprawl and increasing connection to the environment as well as fresh food just plain tastes better. CSAs [Community Supported Agriculture]: CSAs are a great way to support local farms and receive great fresh produce. Check out local CSAs in Concord and surrounding towns. Learn more. 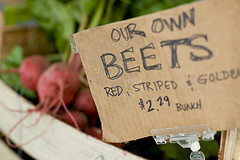 Farm Stands: There are many local farm stands in Concord and in nearby towns. See a list. Farmer's Markets: There are several farmers market around Concord. See a list. Food + Restaurants: While many restaurants use local food, some have made a much greater commitment to supporting local farms and sustainable agriculture. Learn more. Community Gardens: Concord has 2 community gardens and while the waiting list might be long it's never too late to sign up. Learn more. Pick Your Own: Whether you are looking for a family outing or getting back to your hunter gatherer roots, check out these farms. Talkin' Turkey: When the holidays arrive, keep in mind your locally grown food. Pick up your fresh, locally raised turkey or other side dish items and support local farmers. For a list of turkey farms around the Concord area click here.